This website is all about the River Bradford, a small river in Derbyshire that flows through the south of the Peak District National Park. It’s been developed by the Bradford River Action Group, a group of residents from the valley who came together amid concerns at the river’s inconsistent flow and an increasing trend towards the extremes of drought and flood. It reflects a passion for the river, the landscape and the heritage of this special place. The group has commissioned a book called A River in Time to tell the story of the Bradford. It celebrates the river in all its forms, but above all it considers the role played by water in people’s lives and how it is bound up in the local communities of the Bradford valley. The Bradford River Group were very fortunate in having local writer and wildlife photographer, Christine Gregory, commit to producing a book that would reflect the many aspects of the River and the concerns of BRAG. Christine’s dedication to gathering contributions from a wide range of local people with differing views gives the book substance and scope. 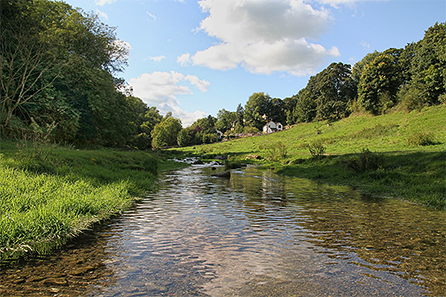 We hope you will find it stimulating and an encouragement to explore our river and its valley, as well as prompting a wider discussion about the management of limestone rivers and water conservation in general. Although A River in Time documents the history of the Bradford, from the rocks that created the valley to the lead miners that worked it and the wildlife that inhabit it, the book is also about looking forwards. A reliable and sustainable flow of water is vital, not least for the locally-run independent water company that supplies much of Youlgrave with its drinking water. As well as generating a debate about water conservation and using our limited supplies more efficiency, proceeds from the sale of the book will be distributed via a locally administered fund that will seek to aid river- or water-related conservation work in the River Bradford locality, including the communities of Alport, Middleton and Youlgrave.